By using Ozhotels you can compare a group of independently owned and unrelated hotels, resorts and serviced apartments that are situated in the holiday destination of Broadbeach on the Queensland Gold Coast. Here you will be able to deal directly with any of these apartments and resorts, ensuring that you get the best possible Broadbeach accommodation rates available. So if you are after discount resort or apartment holiday accommodation in Broadbeach then book online in order to save yourself some money. 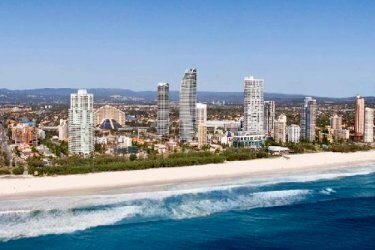 The popular tourist destination of Broadbeach is ideally positioned on the Queensland Gold Coast and is a delightful place that is filled with lots of things to see and do. It also have plenty of places to stay, ranging from fully self contained holiday apartments and resorts right through to luxury hotels and budget motels. This wide variety of Broadbeach accommodation is what makes finding the ideal place for your next holiday a difficult and time consuming task. This is why many people like to use the free services of an accommodation expert like OzHotels in order to help them find the right place. This sevice allows you to compare hundreds of different properties that are situated all around Broadbeach in order to find the one that meets your travel budget. The main advantages of using OzHotels to book online is that you can book your travel up to 12 months in advance and that you will be able to get an extra discount off the already cheap rates the longer that you holiday in Broadbeach. The Breakers Apartments in Broadbeach provides absolute beach front apartment accommodation with direct access to a patrolled surf beach. The Breakers is also centrally located on the Queensland Gold Coast, within easy walking distance of the many exciting attractions of Surfers Paradise and the cosmopolitan ambience of Broadbeach. At The Breakers Apartments Broadbeach guest can enjoy 4 styles of accommodation rangin from spacious family sized apartments, luxury penthouses and unique Beachfront Cabanas. Whilst you are enjoying your next Gold Coast holiday at The Breakers Apartments you can take a stroll along the beautiful beachfront, do some shopping at the Pacific Fair shopping centre, visit the Gold Coast's Jupiters Casino or maybe spend a day at the Movieworld, Wet N Wild, Dreamworld and Seaworld theme parks. 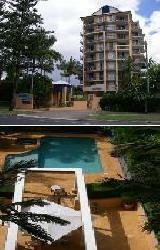 For more Broadbeach Apartments click here. The Belle Maison Apartments is the perfect choice for quality and luxury Broadbeach accommodation at an affordable price. This 4.5 star Broadbeach property provides beautifully appointed and very spacious 1, 2 and 3 bedroom fully self contained air-conditioned apartments, ideally located only a few metres from the beach and minutes from Jupiters Casino, the Gold Coast Convention Centre and the Broadbeach restaurant precinct. Guests staying in the Belle Maison Apartments will enjoy the modern decor, furnishings and fittings in these Gold Coast apartments as well as the spacious private balconies that offer magnificent panoramas of the surrounding the Gold Coast and the Gold Coast hinterland. Conveniently located across from the fabulous Broadbeach beach the Hi Ho Beach Apartments is the ideal Broadbeach accommodation for your next Queensland holiday. Positioned in the heart of Broadbeach within close proximity to Jupiters Casino, Gold Coast's new convention centre and the Pacific Fair & Oasis shopping centres the Hi Ho Beach Apartments has everything that you will need at your fingertips. Each of the apartments at the Hi Ho Broadbeach is fully self contained and has a balcony where you can simpy sit back, relax and take in the spectacular views of the Pacific Ocean. With many fantastic restaurants, bars and cafes only a short walk away from this cheap Broadbeach accommodation and the famous Gold Coast theme parks only half an hour drive away the Hi Ho Beach Apartments is the perfect place to stay. The luxury 1, 2, 3 and 4 bedroom apartments at the Oceana on Broadbeach is ideally situated directly opposite the pristine surf beach that Gold Coast is famous for. This quality Broadbeach accommodation is extremely spacious with large private balconies and wonderful ocean and beach views. 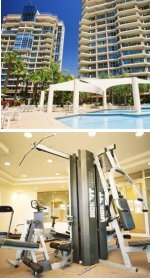 The Oceana on Broadbeach's resort style facilities include 2 swimming pools, BBQ area, sauna, spa and a fully equipped gynmasium. Oceana on Broadbeach Apartments provides a wide variety of luxury apartments which is perfect for couples looking for a romantic getaway, large family holidays and friends sharing their Broadbeach accommodation experience. 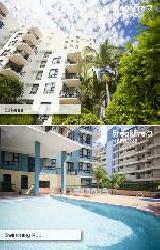 The Neptune Resort Apartments are positioned in the heart of Broadbeach and offer holiday makers modern 1 & 2 bedroom self contained serviced apartments. It is located just 250 metres from the the lifesaver patrolled Kurrawa Beach and is just a short stroll from the Oasis Shopping Centre. The Neptune Resort in Broadbeach is close to everything that the Gold Coast has to offer, as well as having a numerous guests facilities and services including direct internet access, faxing facilities, free car parking, guest laundry, gym, lift, restaurant, sauna, spa, outdoor swimming pool, tennis court, tour desk, bbq, baby cots available and even a babysitting service. The Neptune Apartments is the perfect Broadbeach accommodation choice for both families and couples on holiday in Queensland. 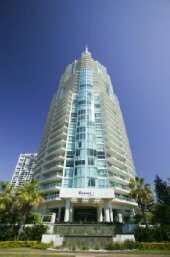 The San Mateo on Broadbeach provides fully self contained 1 & 2 bedroom serviced apartments & penthouses ideally positioned just 50 metres from the fabulous patrolled Gold Coast beach. San Mateo on Broadbeach Apartments Resort is ideally located in the heart of the Gold Coast tourist mecca of Broadbeach, just a short stroll along the beach promenade to the Broadbeach and Oasis shopping centre restaurants, shopping and cafes. 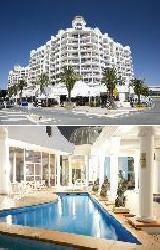 The San Mateo on Broadbeach provides all types of travellers with discount accommodation in Broadbeach. It also features a wide range of modern amenities and services such as direct internet access, faxing facilities, free car parking, guest laundry, lift, spa, outdoor swimming pool, tour desk, bbq, baby cots available and babysitting service. The Phoenician Apartments Resort Broadbeach has a range of luxury 1 & 2 bedroom self contained apartments which are centrally located in Broadbeach. Situated atop award winning cafes and bistros, within minutes walk of Pacific Fair, Oasis Shopping Centre, Jupiters Casino, the Gold Coast Convention Centre and Kurrawa beach, guests of The Phoenician Apartments Resort Broadbeach are spoilt for choice. The Phoenician Apartments Resort in Broadbeach is close to everything that the Gold Coast has to offer, as well as having a numerous guests facilities and services including direct internet access, free car parking, guest laundry, fitness equipment, lift, massage, sauna, spa, outdoor swimming pool, tour desk, bbq, indoor pool, baby cots, babysitting service and daily housekeeping. Located in the chic restaurant and dining hub of Broadbeach, the Phoenician Apartments Resort is the perfect base for your Gold Coast holiday or business trip. Whenever you are visiting the Queensland Gold Coast you should stay at the Boulevard North Holiday Apartments, where all of the fully self contained apartments are north facing and have amazing ocean views. The resort style accommoadation at the Boulevard North consists of 1 & 2 bedroom self contained apartments that are close to everything that Broadbeach and the Gold Coast has to offer. 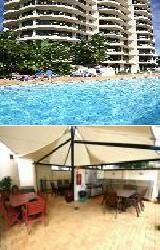 The property also has numerous guests facilities and services including direct internet access, faxing facilities, free car parking, lift, sauna, spa, outdoor swimming pool, tennis court, tour desk, bbq facilities, landscaped garden, airport shuttle, security access and baby cots available for families. The Boulevard North provides the perfect holiday apartment accommodation in Broadbeach that is opposite the magnificent beach and centrally located close to the main Gold Coast attractions. 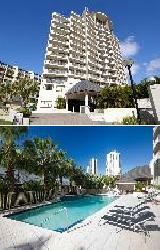 Carmel by the Sea Apartments is one of Broadbeach's landmark high rise accommodation buildings. Carmel by the Sea Apartments is superbly located on the Gold Coast beachfront in the heart of Broadbeach and features stunning ocean, waterway and Gold Coast hinterland views from the spacious two and three bedroom apartments and luxury penthouses. All of these Gold Coast apartments have been beautifully appointed with modern facilities and have security access to the apartment. 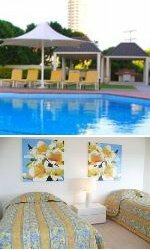 The luxury apartment accommodation at the Carmel by the Sea also features the use of a 20 metre outdoor swimming pool, indoor heated swimming pool and spa, sauna and steam room, gymnasium, children's wading pool and tennis court. The fully self contained 2 bedroom apartments and 3 bedroom split level penthouse apartments with wrap around balconies at the Markham Court are ideally positioned in the heart of fabulous Broadbeach on the Queensland Gold Coast. Set amongst lush tropical gardens the Markham Court Broadbeach is centrally located close to beaches, Surfers Paradise, Pacific Fair Shopping Centre, the Oasis Centre, Jupiters Casino, Convention Centre, local bowling clubs, restaurants, theme parks including Sea World, Movie World, Dream World, Wet'n Wild and all Broadbeach and the beautiful Gold Coast has to offer. It also features a wide range of modern amenities and services such as direct internet access, faxing facilities, free car parking, guest laundry, spa, outdoor swimming pool, tour desk, bbq, garden, baby cots available, babysitting service, security intercom and luggage storage. Whether you are staying on the Gold Coast for a family holiday, seeking convention accommodation or simply looking for a getaway escape the Air on Broadbeach is definitely the place for you. Air on Broadbeach offers luxury beachfront 1, 2, 3 and 4 bedroom self contained serviced apartments with stunning views spectacularly located in the heart of Gold Coast's cosmopolitan precinct of Broadbeach. Directly across from the beach and foreshore parks, Air on Broadbeach Holiday Resort Apartments has spectacular views east over the Pacific Ocean, south to Coolangatta and north up the coastline to Surfers Paradise and South Stradbroke Island. Located over the famous Oasis Shopping Centre, a monorail links the Air on Broadbeach Holiday Resort to Jupiters Casino, supermarket, exclusive shopping and award winning al fresco dining. 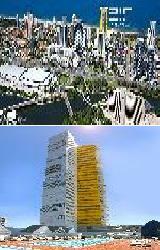 The Gold Coast Convention Centre and Pacific Fair Shopping Centre are also just a few minutes walk away. 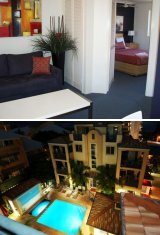 These Broadbeach Apartments have an array of resort facilities including a 25m heated lap pool, childrens pool, full size tennis court, sauna and steam room, outdoor BBQ facilities, entertaining terrace, tranquil sundeck, fully equipped gymnasium, landscaped gardens, residents lounge, tour desk, massage services and FREE security carparking. The Aruba Beach Resort provides fully self contained 1 and 2 bedroom apartments in the heart of fabulous Broadbeach, the cosmopolitan heart of the Gold Coast. Aruba Beach Apartments Resort in Broadbeach is the perfect holiday destination, catering for all ages with the sun drenched sandy beach only 100 metres away, regular arts and crafts markets, boutique stores and within walking distance of the Pacific Fair shopping centre. The Aruba Beach Resort features a wide range of modern amenities and services such as direct internet access, faxing facilities, free car parking, gym & fitness equipment, secretarial services, spa, outdoor swimming pool, tour desk, bbq, garden, security and baby cots available. The Gold Coast's famous theme parks are within easy reach and the Surfers Paradise CBD is just a ten minute drive away. 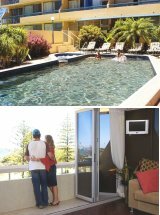 The Bel Air on Broadbeach provides travellers with luxury 1, 2 & 3 bedroom self contained serviced apartments with ocean views, ideally situated within walking distance to the fabulous Broadbeach beach. It is positioned opposite the shopper's heaven of the Pacific Fair and a short stroll to the renown dining precinct in the heart of cosmopolitan Broadbeach. 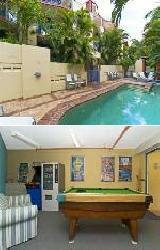 The Bel Air on Broadbeach provides all types of travellers with discount accommodation in Broadbeach. It also features a wide range of modern amenities and services such as direct internet access, disabled facilities, free car parking, gym & fitness equipment, lift, sauna, outdoor swimming pool, tour desk, bbq, garden, indoor pool, baby cots available, babysitting service and daily housekeeping. The location is perfect, being diagonally opposite Jupiters Casino and the Gold Coast Convention and Exhibition Centre, whilst Broadbeach's famed restaurant and shopping precinct and magnificent surf beach are all an easy walk away. 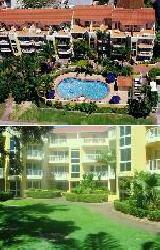 If you are looking to get away from it all, then stay at the Island Beach Resort Broadbeach. This Broadbeach accommodation resort is conveniently located at Broadbeach within an easy strolling distance to all the facilities that Broadbeach has to offer, including the Jupiters Casino, Pacific Fair Shopping Centre, Convention Centre, restaurants and beach. The Island Beach Resort is a quality apartment resort boasting all of the facilities that you would expect from a world class property. The one and two bedroom apartments are spectacularly furnished in Santa Fe style, with a superb design and superior finish. Within the grounds are tropical gardens, entertaining and BBQ areas, gazebo, swimming pool and a resort-style spa pool. Guests will enjoy all the comforts of a top quality resort and also be able to spend a day at the nearby patrolled surf beach. 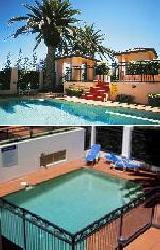 Montego Sands Resort Holiday Apartments offers a taste of Tuscany on the Queensland Gold Coast. AAA Tourism has awarded Montego Sands Resort Holiday Apartments a 4 star accommodation rating plus recognotion for environmental sustainability with the "Green Star" Award. 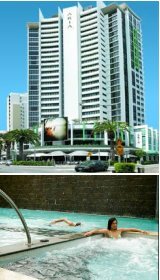 Montego Sands Resort Holiday Apartments Broadbeach offers luxury, fully self contained 1 bedroom standard and deluxe apartments as well as the fantastic 2 bedroom penthouse apartments. Set in a quiet residential street, well away from busy highways and noisy high rises, the Montego Sands Resort Holiday Apartments is the ideal Broadbeach accommodation for couples and families seeking a quiet location only 150 metres from the beach, but only a leisurely 15 minute stroll to the centre of cosmopolitan Broadbeach, Jupiters Casino, the Gold Coast Convention & Entertainment Centre and over 80 fabulous alfresco and fine dining restaurants in Broadbeach. Also close by to the Montego Sands Apartments is the fantastic shopping at the boutiques of the Oasis Shopping strip and Pacific Fair shopping complex. Freshwater Point Resort offers beautifully appointed, air conditioned 1 and 2 bedroom apartments located in a wonderful waterfront setting. This superb, newly built Broadbeach accommodation is perfect for Gold Coast holidays as well as travellers attending the adjoining Gold Coast Convention Centre. Discerning overseas travellers and interstate holiday makers will appreciate the fully self contained, spacious apartments that come complete with modern, luxurious decor, quality fittings and fixtures, an entertainment system and ensuite bathrooms. The Freshwater Point Apartments provides a touch of luxury holiday accommodation on the Gold Coast and is a much better option for business travellers than staying in a corporate Broadbeach motor inn. Guests can relax, unwind and enjoy the famous Broadbeach beach when they stay at the Portobello Beachside Resort Apartments. This afforable Broadbeach accommodation is set in a Mediterranean style resort offering you the best holiday location available with great shopping, numerous restaurants, cafes, bars, casino and entertainment close by. The Portobello Beachside Resort is just a short walk to the Convention Centre Pacific Fair shopping centre, Jupiter's Casino, Dracula's, Broadbeach restaurants and the beach, while only 20 mins from the Gold Coast Airport & 95 mins to Brisbane International Airport. Portobello Resort Apartments Broadbeach offers well appointed and spacious 1 & 2 bedroom fully self contained apartments and penthouses, all with private balconies. Guests can spend their days lazing in the spa, swimming in the sparkling pool and enjoying barbecues out under the trees. With the great amenities, central location and value for money rates the Portobello Resort Apartments provides the perfect Broadbeach Gold Coast accommodation for a family holiday or a couples getaway. 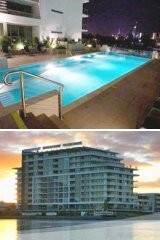 Aria Apartments is an exciting urban icon building which is superbly situated in the heart of Broadbeach. Aria Apartments has open spaces flooded with light and exudes simplicity while providing luxury apartments with attitude. The ultra modern Aria Apartments is a stunning high-rise Gold Coast holiday accommodation which sets new standards for Broadbeach. It combines the privilege of a central Gold Coast location with stunning ocean views, absolute comfort and the assurance of total security. If you've been looking for the ultimate in Gold Coast apartment accommodation then look no further than the Aria Apartments Broadbeach. Situated just a 200 metre walk from the patrolled beaches of Kurrawa and with Broadbeach's Pacific Fair shopping centre, Gold Coast Convention Centre and Conrad Jupiter's Casino are only a few minutes walk away the Aria Apartments is the ultimate in Broadbeach apartments. 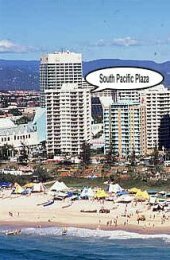 When you are looking for memorable holiday it's all about the location and South Pacific Plaza Apartments fits the bill perfectly. This quality Broadbeach accommodation provides affordable 1 and 2 bedroom apartments right in the heart of the Gold Coast's Broadbeach. Guests can walk to the Oasis Shopping Centre, Pacific Fair shopping centre, Jupiters Casino, as well as a multitude of restaurants, bars and cafes. Situated opposite the beautiful Broadbeach beach, these Gold Coast apartments really do provide the perfect Broadbeach destination for your next family holiday. 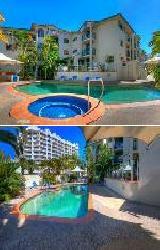 The accommodation at the Ocean Royale Apartments in Broadbeach is centrally located on Queensland's famous Gold Coast. These Gold Coast apartments are on the oceanside of beautiful Broadbeach, only 50 metres to the patrolled surf beach, restaurants, street cafes and just a few minutes walk to Gold Coast's Jupiters Casino. At the Ocean Royale Apartments Broadbeach holiday makers can select from a range of spacious 1 and 2 bedroom fully self contained apartments with ocean or Gold Coast hinterland views, each with private balconies, FREE cable TV and secure undercover car parking. Other features of the Ocean Royale's Broadbeach accommodation include a heated outdoor pool with landscaped gardens, a heated indoor pool with spa, a half court tennis court, BBQ area and pergola. Alternatively you can spoil yourself in the two-storey penthouse apartment with spectacular ocean views, a private plunge pool and private sauna. 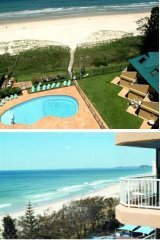 The Ocean Royale Apartments Broadbeach contains everything to make your Queensland beach holiday relaxing and enjoyable. 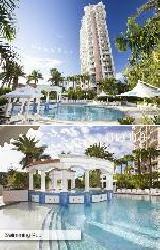 The BreakFree Savannah Resort provides luxury studio spa apartments in cosmopolitan Broadbeach. Literally on the doorstep are Conrad Jupiters Casino, the Gold Coast Convention and Exhibition Centre, magnificent beaches, world-class shopping and some of Queensland's best restaurants. The BreakFree Savannah Resort in Broadbeach is close to everything that the city has to offer, as well as having a numerous guests facilities and services including child minding, conference centre, direct internet access, disabled facilities, faxing facilities, free car parking, guest laundry, fitness equipment, lift, massage, restaurant, sauna, spa, outdoor swimming pool, tour desk, bbq, massage room, garden, baby cots, babysitting service and daily housekeeping. Conveniently located near the best of Broadbeach, the resort offers a wonderful holiday experience that can be as casual and relaxed or as refined and energetic as you like.